If something or someone is swift, it means that it or they can move with great speed and if a decision or an action is swift, it means that it was performed quickly. Swift can also mean ‘quick to act or respond.’ Mostly in US English, it can be used figuratively as a synonym for clever, though this use is a bit dated. 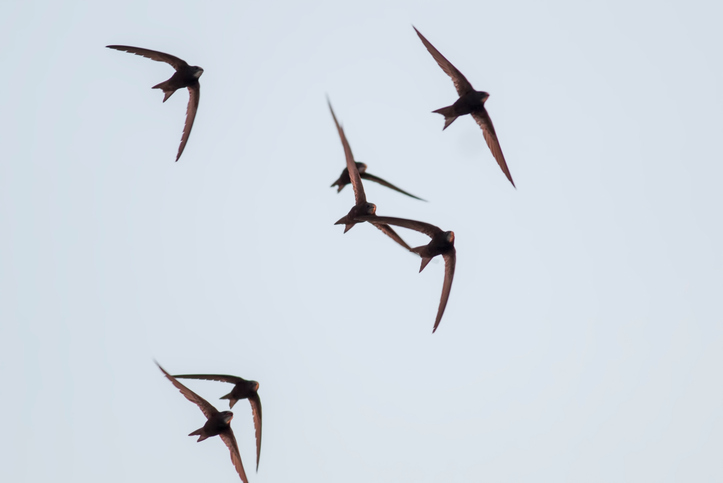 As an adverb, swift means ‘in a quick way.’ A swift is a long-winged, swallowlike bird. The swift vessel sped across the harbor. One of the competition entries was clearly much better than the others, so the judges' decision was swift. We shouldn't be too swift to jump to conclusions. You can't fool Amber; she's too swift. The yacht sailed swift across the waves. A swift flew past the window. Swift can also be used in combined form with adjectives, for example swift-moving or swift-flowing. Swift dates back to before the year 900. The Old English adjective already looked just like it does now: swift. Its meaning, however, has not always been ‘moving quickly,’ as it is now. Back then, it was ‘turning quickly.’ It can be traced back to the Proto-Germanic root swip– and the Proto-Indo-European root swei– (to turn, bend, or move in a sweeping way), and is related to the Old Norse svīfa (to rove) and the Old English verb swīfan (to swivel, revolve or sweep), as well, of course, as the modern English verb swivel. It has been used as an adverb since Middle English (the first examples can be found in the late 12th century). The noun swift, meaning a type of bird, dates back to the mid-17th century. It comes from the adjective, a reference to the bird’s quick flight. Before becoming the name of a bird, swift was a name given to several small, fast moving lizards in the early 16th century.